Cerreto Sannita, 1724 - ?, ? Having trained in the fruitful workshop in Cerreto Sannita, Silvestro Jacobelli made a name for himself working with ceramics in particular, to which he dedicated himself after moving to Naples. The works he produced consist largely of wooden Madonnas, preserved in countless churches in Cerreto and the Sannio region. 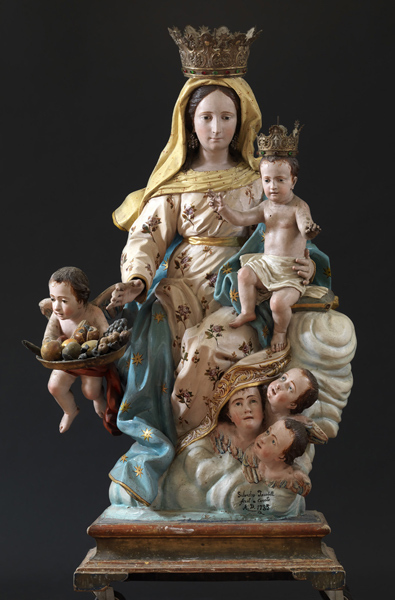 As well as an Immaculate Conception held in the Diocesan Museum of Sant'Agata dei Goti, Jacobelli's exhibited works also include a few models in terracotta, shown in the Museum of Cerreto Ceramics, such as Saint Michael and the Devil and the Madonna of Providence. After 1758, Jacobelli was sent to Mexico by Ferdinand IV, where he achieved great success, and probably never returned.